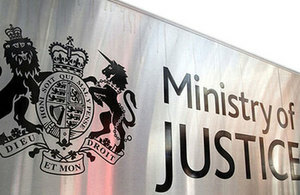 The Government's long-awaited review into legal aid cuts (as introduced by the Legal Aid, Sentencing and Punishment of Offenders Act 2012 or LASPO) was published last week by the Ministry of Justice. You can read the 293-page review here (and we've excerpted the section on immigration below). The review is accompanied by a 43-page action plan here, which sets out the Government's proposals. Free Movement reported: "Despite evidence of the impact of cuts over the past five years, and the role that legal aid would have played in preventing the Windrush scandal, the Ministry of Justice has refused to roll back [LASPO] as it relates to immigration work. The sole exception is an amendment granting legal aid to unaccompanied migrant children." The Bar Council responded to the review by saying: "The Bar Council is disappointed with the Government's post-implementation review of [LASPO] published today. When the Bar Council gave evidence to the Ministry of Justice last year on the impact of the LASPO cuts to legal aid we identified five priorities to help reverse the decline in legal aid provision over almost six years. Few have been addressed." The Law Society was more positive and said the review's proposals were a shift in the right direction. In a statement, the Law Society said: "The proposals reflect a considerable number of the recommendations we put forward. The Ministry has accepted the case for changes in relation to the legal aid means test, exceptional case funding and early legal advice, and has committed to further work as to what those changes should look like. There are also to be specific changes immediately in relation to migrant children, special guardianship orders and the telephone gateway for discrimination, debt and special educational needs. There is much to be welcomed." The Legal Aid Practitioners Group (LAPG) said: "The report is an overdue recognition of the crisis in access to justice, triggered by LASPO. Many of the recommendations for the future are positive, but much more is needed to remedy the legal aid and justice system now." The review states: "Some stakeholders asserted that many solicitors had abandoned legal aid work, leading to advice deserts for certain categories of law, particularly immigration and housing." 249. Asylum cases were not removed from the scope of legal aid for a number of reasons. The Coalition Government believed that the nature of the issues at stake and the particular vulnerability of the client group made asylum cases a sufficient priority to remain in scope. 250. Most non-asylum cases were removed from the scope of legal aid, with some exceptions (set out below). These exceptions were identified as priority areas due to the importance of the issues at stake, as well as the absence of other routes to fund or resolve them. iii. separated and unaccompanied asylum-seeking children. 252. The provision of legal aid for asylum was not altered by the LASPO scope changes. 253. Prior to LASPO, legal aid was provided for a wide variety of (non-asylum) immigration issues, with provision covering advice on applications, advice and representation for appeals at the First-Tier and Upper Tribunal in the Immigration and Asylum Chamber, and advice on onward appeals to the higher courts. i. Immigration detention, including cases where the client detained is seeking asylum. ii. Proceedings before the Special Immigration Appeal Commission (SIAC). iii. Applications and appeals for indefinite leave to remain and residence cards under the specific Immigration Rules relating to victims of domestic violence. v. Judicial review of certain immigration decisions. This is limited to where there has not been a previous unsuccessful appeal or judicial review on substantially the same issue in the previous 12 months. 255. LASPO was further amended by the Modern Slavery Act 2015  to increase the scope to include legal aid for applications for leave to enter, or to remain, where the individual is a victim of slavery, servitude or forced or compulsory labour, or there are reasonable grounds to believe that the individual is such a victim. 256. In July 2018, the Government also committed to expanding the scope of legal aid to immigration matters covering separated children. Following a judicial review brought by The Children's Society, the Ministry of Justice examined the evidence in that case and data on applications for funding. Because of the distinct nature of the individuals affected and as a result of the data review, the Government decided to bring these cases into scope of legal aid. The amendment will be laid in due course following discussion across Government and with external stakeholders. To what extent has the LASPO scope change achieved its original objectives in this area? 257. The following analysis for immigration legal help is split into asylum and non-asylum cases. To be able to distinguish the two from the LAA data, claims data has been used, rather than matter starts as for the other civil categories. Given that the average duration of both asylum and non-asylum legal help claims is less than a year, the vast majority of cases have completed and this should not have any impact on the analytical accuracy of the trends. 258. For civil representation, the data collection did not distinguish between asylum and non-asylum issues until 2012-13, and the recorded data has not shown the split accurately until 2016-17. In the last two years (2016-17 and 2017-18) over 90% of the civil representation grants have been recorded as asylum work. 259. For immigration cases, legal representation at a tribunal can be carried out under Controlled Legal Representation, which does not require a certificate to be granted in advance. The trends for legal help in the following analysis also includes CLR. 260. Overall, the policy change has achieved its objective of making significant savings in the immigration law category. In line with the change in volumes, the change saved less than anticipated for legal help, but saved more than anticipated for civil representation. 261. Due to the estimated 89% fall in volumes, the IA estimated a 92% drop in immigration legal help expenditure. For civil representation, it was predicted that volumes would reduce by 20%, and spend by 24%. From the 2009-10 baseline used in the IA, this would have been a drop of 53,000 cases for legal help, saving £20m, and a drop of 290 cases for civil representation, saving £1m. This is shown in Figure 18. 262. Figure 19 shows a summary comparison of the estimates in the IA and the actual change between the new baseline year of 2012-13 and 2017-18. Figure 20 provides greater detail on spend. 263. Since the introduction of LASPO, spend on legal help in non-asylum immigration cases has declined by 80% from £10m to £2m. This is less than the 89% estimated in the IA, although a greater proportion of non-asylum cases are being funded through the ECF scheme, which the IA did not anticipate. The total reduction in spend on non-asylum immigration legal help (£9m) is less than the £20m anticipated in the IA, because the decline in volumes before the scope changes reduced the actual spend before LASPO. 264. However, civil representation spend for both asylum and non-asylum immigration has declined by a greater extent than anticipated. Spend reduced by £7m, rather than £1m, because the volume of cases fell by 1,900, rather than 290 anticipated in the IA. This could be due to the decline in the number of immigration and asylum receipts more widely, due to more judicial reviews being funded under Public Law contracts or changes to the judicial review remuneration provisions, discussed in more detail in chapter 3. 265. Therefore, immigration scope change has met its objective of making significant savings to the cost of the scheme. 266. Whilst the scope changes were focused on reducing the remit of legal aid, the decisions as to what was a sufficient priority to remain in scope were based on factors such as the ability of the individual to self-represent, the likelihood of breach of international obligations in the area of law, and the availability of alternative sources of advice and funding. Therefore, the impact of the scope changes on the volumes of legal aid has been largely considered on the next objective – whether LASPO has been successful at targeting legal aid at those who need it most. 267. The changes to the scope of legal aid for immigration matters were designed to ensure that legal aid remained available for the highest priority of cases. The policy has been successful at targeting legal aid towards asylum cases, which the Government deemed were the highest priority in this context. 268. Matter starts for immigration cases cannot be broken down into asylum and non- asylum cases until a claim for the case is made. This is because providers are not required to record the specific sub-category at the start of a case as they may not know at the beginning of the case or the nature of the case may change. 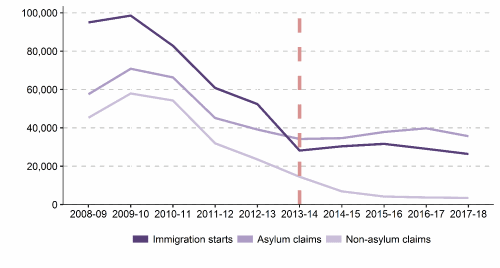 It was estimated in the IA that the removal of (most) non-asylum immigration matters from the scope of legal aid would lead to a 92% decline in non-asylum immigration Legal Help volumes. 269. Figure 21 shows how the number of legal help matter starts in immigration cases has declined since 2009-10. Between 2009-10 and the pre-LASPO baseline year (2012-13) the number of starts fell from 98,500 starts to 52,400. From 2013-14 onwards, the volume of matter starts is stable. This graph illustrates the extent of the pre-LASPO decline which affected the extent to which the estimate outlined in the IA was realised. 271. Figure 22 provides a breakdown of the case-mix of non-asylum immigration legal help cases and the changes throughout the period. The table demonstrates that, as expected, the areas of law which were affected by scope changes have also seen the greatest level of decline in volumes. The remaining legal help volumes, in categories such as 'Leave to Remain' (which was removed from scope), have been granted legal aid through the ECF system. The only categories of work to increase in legal help volume since LASPO are bail and domestic violence related work, and the latter is a new category in terms of data collection so is incomparable to pre- LASPO levels. 272. For civil representation, the IA estimated a 20% drop in volumes of immigration cases. In contrast to legal help, civil representation for immigration law saw no considerable decline in volumes prior to LASPO. As a result, the impact of LASPO is more apparent. Civil representation volumes fell by 62%, between 2012-13 and 2017-18, going from 3,100 certificates granted to 1,300 (Figure 23). 273. When considering both asylum and non-asylum cases in 2017-18, 85% of civil representation certificates granted were for judicial review, which is a similar proportion to that in 2012-13 (88%), although the volume of other cases has of course reduced, as discussed previously. Of the 1,200 certificates granted from 2017-18, fewer than 30 were for non-asylum, other, or cases where it is not possible tell from the recorded information. 274. As Figure 24 shows, over the last 6 years, the volume of receipts (all cases – not just cases where legal aid funding is present) peaked in 2013-14, but have since declined considerably. As such, the fall in legal aid cases could also be attributable to the general fall in immigration and asylum cases that are now passing through the system, for whatever reason. 275. Overall, the immigration scope change has targeted legal aid towards asylum cases (although they were previously in scope), as was intended at the outset of the policy. Some unintended or secondary impacts of this change has been discussed below at paragraph 285. 276. There was the sense, from stakeholders, that protected groups, and vulnerable people more generally, had been adversely impacted by the immigration scope changes. 277. LAA client diversity data for legal help considers asylum separately to non-asylum cases. For asylum cases, the distribution of clients across the respective age group has remained broadly the same. Similarly, the proportion of male clients has remained broadly the same (72% in 2012-13 to 74% in 2017-18). The proportion of clients from ethnic minorities has decreased from 55% in 2012-13 to 40% in 2017-18. However, given the nature of asylum cases, it is likely that a high proportion of clients of which their ethnicity is unknown (43% in 2012-13 and 55% in 2017-18) may be from ethnic minorities. Clients declaring a disability remained steady with 4% in 2012-13 and 5% in 2017-18, although there was no recorded data for 29% and 20% in those years respectively. 278. For legal help in non-asylum cases, the distribution of clients across the respective age group has remained broadly the same. There has been an increase in the proportion of male clients, from 58% in 2012-13 to 67% in 2017-18. Around one third of clients' ethnicity is not reported, but the proportion of ethnic minority clients has declined from 63% in 20121-3 to 55% in 2017-18. The proportion of clients declaring a disability was 6% in 2012-13 and 8% in 2017-18, although the response is not recorded from 27% and 35% respectively. 279. For civil representation, the client diversity data does not separate asylum and non- asylum cases. The age and gender distribution of clients remains broadly similar, with 71% male in 2012-13 and 72% male in 2017-18. In 2017-18 49% of clients were from an ethnic minority background, with a further 39% unknown, which is broadly unchanged from 2012-13. The proportion of clients reporting a disability has increased from 11% in 2012-13 to 22% in 2017-18, although the declining proportion of those without recorded data (from 26% to 10% over the same period) could be the masking the true effect. 280. Using the NAO criteria outlined in the introduction (paragraphs 107-113) we can conclude that the scope changes to legal aid provision for immigration matters have been largely economical, since there has been a £15m reduction in spend on immigration matters following the introduction of the scope changes. 281. To assess overall value for money it is necessary to consider the extent to which costs have been shifted away from the legal aid fund and towards other parts of government. Indeed, Coram Children's Legal Centre (Coram) and others have argued that these costs have been shifted onto local authorities to an extent which may outweigh that of the corresponding legal aid provision. Due to data limitations, it is not possible to assess the extent to which this cost shifting has taken place. 282. Another aim was to better target legal aid at those who need it most which, in this case, was deemed to be asylum seeking applicants. As such, this policy has been broadly effective, although volumes of asylum cases have dropped slightly. Whilst there were no scope reductions to such applicants, the scope changes elsewhere may have unintentionally reduced awareness more widely, or wider factors may be driving these trends. 283. Some stakeholder feedback suggests that efficiency and equity may have been hampered by these policies. In particular, stakeholders have pointed towards issues pertaining to self-representation by particularly vulnerable groups and the risk of losing broad legal expertise in all immigration matters as providers specialise in asylum law. Data limitations prevent us from properly assessing the efficiency and equity effects of these scope changes, nor can we robustly address whether the savings represent savings to the government as a whole or the LAA alone. Consequentially, it is not possible to make a firm conclusion regarding the extent to which these policies represent better overall value for money for the taxpayer, although some of the key themes heard through engagement have been discussed below. 284. Isolating the impact of LASPO against a multitude of other variables across Government and wider society is complex, hindering the availability of clear and reliable data. However, the Government recognises that determining the extent to which LASPO changes represented overall value for money for the taxpayer is important, and to do this we must obtain a better understanding of this purported cost transference. We will be continuing our work with colleagues across Government to improve our collected data on this issue to inform our assessment of this. 285. During the evidence gathering phase of the review, interested parties (such as the Immigration Law Practitioners Association) raised concerns over the availability of providers to undertake immigration law cases. It has been claimed that, since the introduction of LASPO, it has become more difficult for organisations and charities to refer individuals, who may be eligible for legal aid, to an appropriate provider. The number of providers is discussed in more detail below. 286. The Anti Trafficking and Labour Exploitation Unit (ATLEU) raised concerns regarding areas of the country where people are unable to access legal advice due to the geographic availability of providers. It was also claimed that there is significant demand for the services in affected areas and, as a result, people are having to travel long distances to access support. Stakeholders were sceptical that those outside of the metropolitan areas of London, Birmingham and Manchester, would be able to obtain legal advice. 288. Since 2000, people receiving Government support who are being processed through the asylum system have been dispersed throughout the country. It was argued that this factor is the key driver of demand for immigration lawyers in some areas of the country. Anecdotal evidence from practitioners and advice providers suggests that, due to the limited nature of coverage, individuals have found themselves unable to access legal advice after being dispersed as there are no providers in the local area. 289. Practitioners have stated that, due to the reductions in legal aid in immigration matters, there has been a trend towards immigration practitioners specialising in specific areas of immigration law. Firms are increasingly focusing on asylum law, specifically because it remains in scope of legal aid funding. As a result, fewer practitioners now have a broad knowledge of the entire immigration system. It has been claimed that this is having a detrimental impact upon providers' ability to effectively redirect the cases of individuals presenting with an immigration issue. 290. Although there has been a decline in the number of providers, some third sector organisations asserted during the evidence gathering phase that other forms of advice have increased, including fee-charging private providers, lawyers undertaking pro-bono work, the third sector, or increased support from individuals' own support network (including friends and/or family). However, some interested parties cautioned that, those trying to afford fee-charging advice, are at a greater risk of exploitation. Whilst anecdotal evidence is important and valuable, LAA data suggests that, since 2012-13, there has been a 15% decline in the number of providers completing immigration cases. This decline is to be expected due to reduced demand for legally aided work following the reduction in the scope of legal aid for immigration law. 291. LAA data also shows that there is some regional variation in the reduction in providers. Some regions have had an increase in the number of providers doing immigration work compared to 2012-13 (Merseyside, North East, North West, West Midlands, Yorkshire and Humberside), whilst the number of providers have fallen in others, including the Eastern region (-50%) and London (-35%), as shown in Figure 25. 292. The change in the number of immigration providers in local authority areas in each region is detailed in Figure 26. Although, concerns have been raised about the number of providers in a local authority, this cannot be directly compared to LAA procurement areas. The LAA have 6 procurement areas, each containing 26 access points (totalling 156 access points) whereas there are over 300 local authority areas. 293. Although the total number of providers completing immigration work has reduced by 247 overall, in a number of regions this has not increased the number of local authorities with no providers completing immigration work. London has had the largest increase in the number of local authorities with no providers completing immigration work. However, as local authorities in London are geographically small, it is unlikely that LASPO has caused a substantial increase in the distance individuals in London will have had to travel to receive legal advice, although this may not be the case for the Eastern region. 294. It is important to note that not having a provider based within the local authority area does not mean the local population does not have access to legally aided advice. As the LAA awards its contracts by local procurement areas that are larger than local authority areas (there are around 156 LAA procurement areas for immigration and over 300 local authority areas), many providers will work with clients who live in a different local authority area from where their (the provider's) office is located. 295. The number of offices holding immigration law contracts reduced by 11%, and the number of offices closing cases reduced 14% between 2012-13 and 2017-18, the latter signifying the number of offices actively undertaking work. The close proximity of these two figures provides an indication that the majority of providers holding contracts are undertaking work in this area. However, this measure can only be seen to provide an indication of the extent to which providers are being utilised as the significant length of time taken to complete immigration cases could be masking firms that are no longer taking on new cases. 296. It has been argued by some organisations that even in areas where there are solicitor's firms undertaking legally aided immigration work, individuals and charities have difficulty finding an immigration provider willing to take on their case. It is claimed that providers currently holding legal aid contracts no longer find it financially viable to undertake cases and so are no longer accepting legally aided clients. For instance, Refugee Action state "this is particularly a problem for cases that are more complicated, as there is little incentive for representatives to take them on when they know that they will not receive payment commensurate with the time spent working." However, the provider's contract with the LAA states that "good cause" for declining Controlled Work "does not include any considerations regarding the level of any [Standard or Graduated] fee you [the provider] may be entitled to receive under this Contract." 297. Each provider, as part of their contract with the LAA, has a maximum number of matter starts for controlled work a given area of law. Between 2012-13 and 2017-18, the total number of allocated maximum matter starts has fallen at a greater rate than the number of offices with contracts (-51% vs -11%), which suggests that each office on average now has a lower number of matter starts than it did pre-LASPO. This is to be expected as a consequence of reducing scope, and consequently the number of potential cases. 298. It is possible to assess the frequency with which providers are cancelling contracts on the basis of 'contract viability'. Cancelling contracts for this reason means that firms withdrew from a contract as the work was no longer financially viable or they wished to concentrate on another area of work perceived as more commercially viable. It is important to note that the overall volume of immigration and asylum cases has declined, not just the volume of legally aided funded cases, which may have impacted on the financial viability of undertaking this work. 299. In 2017-18, there were 309 current contracts to do immigration work and over the year, 11 (of 35 total cancellations and cancellation requests) were cancelled or requested to cancel with commercial viability cited as the provider's reason. This means that of all contracts for immigration work in 2017-18, 4% were cancelled citing commercial viability. This is an increase on the proportion of contracts that were cancelled for this reason in 2012-13 (12 cancellations, or 1% of all contracts). 301. A number of interested parties, including Amnesty International, the British Red Cross and The Children's Society, have expressed that they find the reasoning for the reduction in legal aid inconsistent with the level of regulation of immigration advice, which limits the sources of advice and assistance because immigration law is complex and often changes . Since 1999 there have been eight new Immigration Acts. The number of immigration rules has doubled since 2010 and concern has also been raised around the complexity of the rules. 302. Interested parties have asserted that expertise and specialist knowledge is required to understand the substance of immigration law, how it applies to a particular case, how to articulate a legal argument, and how to gather evidence. The difficulties associated with this are exacerbated by language barriers and poor literacy and communication skills among some individuals seeking immigration advice. i. To review the Immigration Rules to identify principles under which they could be redrafted to make them simpler and more accessible to the user, and for that clarity to be maintained in the years to come. ii. The project might include consideration of the structure and drafting of the Rules, the timing and frequency of amendments to the Rules, the division of material between Rules and guidance and the way in which the Rules are published. The Commission will seek to identify the underlying causes of excessive length and complexity in the Rules and make recommendations to improve them for the future. iii. The project will include a public consultation. It will conclude with a report setting out the Commission's recommendations and including a redraft of some of the Rules putting some of those recommendations into effect. 307. There are routes for undocumented children to regularise their status, however it was reported that such applications can be difficult without advice and representation. Many of the young people The Children's Society spoke to were not entitled to legal aid and experienced periods of material and psychological hardships, including mental health problems and periods of destitution. Coram argue that LASPO has shifted these costs onto local authorities, and that the restoration of legal aid for all migrant children would result in an annual saving for the Government. This was echoed by Amnesty International, the Office of the Children's Commissioner, and Just for Kids Law. As previously mentioned, the Government have committed to introducing legal aid for separated child migrants, for immigration matters. 308. Part of the rationale for the scope change was that going to a tribunal is an accessible process that allows individuals to be able to make a successful application without legal representation. The application process is designed to be relatively straightforward, with support provided where necessary to vulnerable individuals. 309. As part of the HMCTS reform programme, we are exploring how we can improve services for immigration and asylum cases (as well as public family law). This includes updating the service so cases can be managed digitally. For example, this will enable evidence to be submitted and shared electronically, meaning cases can be managed more securely and effectively. 311. The Home Office have introduced a range of measures since 2010 to support the quality of decision making in United Kingdom Visas & Immigration, including training and mentoring programmes for new caseworkers as well as a wider assurance process. Assurance processes follow the '3 lines of defence' model. Case sampling, regular and systematic analysis of allowed appeal rates, as well as other sources of information such as complaints and MPs' correspondence, are used to improve the consistency and effectiveness of decision making across all routes. 312. Other initiatives have been piloted since 2010, including the use of Assisted Decision-Making tools to encourage consistency in decision making, the streaming of cases to ensure that the most complex cases receive an appropriate level of attention, and review of decisions by presenting officers to ensure that decisions are fair and robust before reaching appeal. 313. Despite the clear improvements since 2010, the Home Office recognises that further improvements are needed to the sustainability of decisions and the quality of engagement with applicants. A new central UK Visas and Immigration (UKVI) Chief Caseworker Unit was established at the start of June, led by the newly created post of Chief Caseworker, and supported by a cadre of experienced senior caseworkers recruited from across the Home Office. This new unit will bolster case-working expertise and ensure that caseworkers have a clear escalation route where they have a concern or require specialist guidance. A new post of UKVI Caseworker Training lead has been created and appointed. This will help improve decision- maker training capability, establish career paths for decision makers and help to create a stronger and more customer focused culture. A series of initiatives are in train which test, trial and implement new working processes across UKVI and help reduce the number of refusal decisions overturned at appeal. We will continue to work across Government to explore decision making. From September 2018 Upper Tribunal cases are granted under certificates. The total number of immigration claims in a given year is greater than the number of matter starts because it is possible for a single matter start to produce more than one claim as different stages of the case are billed separately. A client going through the immigration process may make multiple claims. These regions are LAA office regions, so do exactly mirror official Office for National Statistics regions.